On Nov. 5, 1981, Rangjung Rigpe Dorje, the 16th Gyalwa Karmapa, head of the Karma Kagyu lineage of Tibetan Buddhism, passed away in Zion, USA. Since then, followers of the lineage have waited for Karmapa‘s next incarnation. Historically, two necessary components were involved in the delicate process of recognising the next Karmapa: the deeds of the young incarnation, and the oral or written directions left by the predecessor. On Dec. 20, 1981, Karmapa’s cremation ceremony, attended by Indian dignitaries and several thousands of his disciples, took place in Rumtek, Karmapa’s main seat outside Tibet. On Dec. 21, 1981 a general Karma Kagyu meeting was held in Rumtek . Mr. Dhamchoe Yongdu, the then General Secretary to the 16th Karmapa, requested Kunzig Shamar Rinpoche, historically second after Karmapa in the spiritual hierarchy of the lineage as well as Tai Situ Rinpoche, Jamgon Kongtrul Rinpoche and Goshir Gyaltsab Rinpoche, close disciples of the 16th Karmapa, to take joint responsibility for the affairs of the Karma Kagyu lineage. He also asked them to locate Karmapa’s instructions concerning his next rebirth and thus bring forward his next incarnation. Although a four-person body in charge of Karmapa’s recognition was a historical novelty, the four Rinpoches accepted the task and expressed their sincere desire to fulfil the wishes of the 16th Karmapa. On Jan. 21, 1983, at another general Karma Kagyu meeting in Rumtek, it was decided that Topga Yulgyal, who the 16th Karmapa had appointed as Mr. Yongdu’s successor, would commence as General Secretary of the Karmapa Charitable Trust . The Trust, founded by the 16th Karmapa in 1961, was to provide care and management for the Kagyu lineage during the intermediate period after the 16th Karmapa passed away and before the 17th Karmapa attained the age of twenty-one years. Since 1983, rumours about the 16th Karmapa’s reincarnation began to emerge. .
On Feb. 9, 1986, in order to put an end to speculation about the different Karmapa candidates, Kunzig Shamar Rinpoche sent a letter to the Kagyu lamas and monasteries pointing out that the 17th Karmapa would reveal himself in the traditional way . On Feb. 23, 1986, the four Rinpoches met in Rumtek. After their meeting, they issued a statement declaring that two letters by the 16th Karmapa regarding his reincarnation had been found: an “outer” and an “inner” one. They also disclosed that the inner letter was supposed to be opened at an unspecified date in the future, after a certain number of religious ceremonies, described in the outer letter, had been performed . 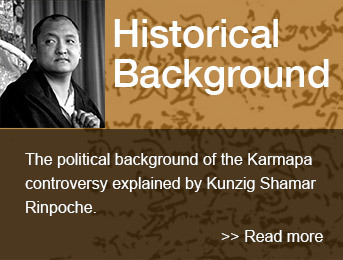 In fact, as they would later admit, the four Rinpoches had not found any letters of instruction from the 16th Karmapa. On April 18, 1986, Topga Rinpoche, General Secretary of the Karmapa Charitable Trust informed the dharma-centres world-wide of the discovery of the letters of instructions, which he believed to be true . On May 4, 1988, the Rumtek staff announced that all rituals specified in the outer letter had been performed, thus the obstacles to open the final testament had been removed. Over the years, the four Rinpoches assured the followers of the Kagyu lineage that the 16th Karmapa’s reincarnation would be found very soon. In 1989 – as he would later claim – Situ Rinpoche discovered by accident Karmapa’s “prediction letter”. Supposedly, he had received the letter shortly before His Holiness passed away in 1981, with no indication whatsoever as to its momentous content. Wrapped in silk, a package was given to him as a protector. He didn’t even know it contained a letter. When in 1989 Situ Rinpoche decided to exchange the worn out fabric that had protected his talisman, instead of the expected relics he found the “prediction letter”. At the end of 1989 Situ Rinpoche informed the other three Rinpoches that he was in possession of „good news similar to the joyful cries of peacocks” . On March 14, 1990, the four Rinpoches met in New Delhi. However, during the meeting, Situ Rinpoche neither mentioned nor presented his “prediction letter” which, according to his own words, he had discovered in 1989. Later, in his talk on June 12, 1992, Situ Rinpoche claimed that he did not want to show the letter at that time because the meeting did not take place in Rumtek but in his hotel in New Delhi. After their meeting, the four Rinpoches wrote a letter to the Karmapa Charitable Trust saying: “We must remain firm in all circumstances, until we arrive at the appropriate time”, indicating that everything would still take some time. From Aug. 1990 until Oct. 1990, the “Chushi Gangdrug Committee” and the “Derge Association”, two political groups operating from Kathmandu, Nepal , wrote letters to the four Rinpoches and the trustees of The Karmapa Charitable Trust accusing them of neglecting their duty in the search for Karmapa’s reincarnation. On Nov. 25, 1990, the four Rinpoches met again in Delhi. In the statement they issued afterwards they rejected the accusations. During this meeting Situ Rinpoche again did not present his “prediction letter” . In 1991, Situ Rinpoche spent several months in Tibet, performing empowerments at Palpung Monastery, his seat in Eastern Tibet, and recognising hundreds of tulkus. Lama Amdo Palden, the abbot of Kalek Monastery in Tibet where a boy Urgyen Trinley had been accepted as a monk, recounted that at that time Situ Rinpoche had given refuge to the boy in Palpung. After leaving for Beijing, Rinpoche sent a mala to Urgyen Trinley as a special protector. On March 5, 1992, the Derge Association sent a letter to the Kagyu dharma centres world-wide. In this letter Situ Rinpoche was presented as being the only person responsible for finding the Karmapa . The other three Rinpoches as well as the General Secretary of the Karmapa Charitable Trust were accused of delaying the procedures. On March 19, 1992, a meeting of the four Rinpoches took place in Rumtek. Situ Rinpoche presented his “prediction letter” which contained detailed information regarding Karmapa’s 17th reincarnation. Kunzig Shamar Rinpoche and also, to some extent, Jamgon Kongtrul Rinpoche expressed doubts as to the authenticity of the handwriting and signature in the letter . Shamar Rinpoche wanted the “prediction letter” to be tested forensically. After hours of discussion the four Rinpoches decided to keep their disagreement secret, to solve the problems among themselves and to meet seven weeks later for further consultations. Jamgon Kongtrul Rinpoche, whom they all trusted and who was soon to travel to Tibet, was requested to make an initial contact with the child on the basis of the instructions from the letter. He was to report his findings to the other three Rinpoches after his return from Tibet. On March 26, 1992, despite the agreement, Situ Rinpoche sent a letter to various dharma centres in the East declaring that the search party for the 17th Karmapa was in place and ready to proceed . His letter was followed by a similar message from the Derge Association. On April 8, 1992, the Tsurphu administration sent a search party for the 17th Karmapa to Kham in Eastern Tibet, (Tsurphu is Karmapa’s main seat in Tibet). Even though the content of Situ Rinpoche’s “prediction letter” was supposed to be kept secret among the four Rinpoches, and despite the fact that only Jamgon Kongtrul Rinpoche had been appointed to contact the child, a Lama Tomo from Tsurphu set out at the head of a party of five to look for the new Karmapa in Kham. On April 24, 1992, a picture of the boy Urgyen Trinley was taken and a pick-up party was organised from Tsurphu . Everything seemed pre-arranged and had the permission of the Communist Chinese authorities. On April 26, 1992, shortly before he was to set out for his journey to Tibet, Jamgon Kongtrul Rinpoche died in a car accident. During the 49 days that followed his death, rituals were performed at Rumtek Monastery. On May 10 1992, Shamar Rinpoche left Rumtek for a scheduled dharma program abroad. It was generally assumed that out of respect for the late Jamgon Kongtrul no further steps in connection with Karmapa’s recognition would be taken during the 49 days of ceremonies. On May 17, 1992, a week after Shamar Rinpoche’s departure, Situ Rinpoche and Gyaltsab Rinpoche delivered a public speech in Rumtek. Breaking their March agreement, they announced that they had sent their own representatives to Tibet to search for the 17th Karmapa. They expressed their regret and concern that Shamarpa wasn’t available at this point for discussion, but unable to wait any longer for the main Rinpoche’s return, they were forced to proceed with their duty. In fact, the search in Tibet was by then over. The boy had already been “found” by the Tsurphu search party in collaboration with the Communist Chinese authorities. On May 20, 1992, Situ Rinpoche and Gyaltsab Rinpoche publicly opened their “prediction letter” in Rumtek and, to gain legitimacy, showed it to Sakya Trinzin, leader of the Sakya school of Tibetan Buddhism. Most people were unaware that although Sakya Trinzin was a highly learned and widely respected lama, he had no role whatsoever in the process of Karmapa’s recognition. On June 6, 1992, Situ Rinpoche and Gyaltsab Rinpoche travelled to Dharamsala to meet H.H. the Dalai Lama. Shamar Rinpoche, carrying on his Dharma program in the West, heard rumours that a boy, supposedly the 16th Karmapa’s reincarnation, was being brought to Tsurphu. On June 7, 1992, Shamar Rinpoche, cutting short his stay in the US, returned to Rumtek and learned that the other two Rinpoches had left for Dharamsala. On June 8, 1992, Shamar Rinpoche gave a talk to the monks of Rumtek Monastery. As the steps undertaken by Situ Rinpoche and Gyaltsab Rinpoche had violated their earlier agreements, he publicly declared his position and his doubts regarding the authenticity of Situ Rinpoche’s “prediction letter”. He also stated that he knew of a close and trustworthy disciple of the 16th Karmapa who was in possession of direct instructions concerning Karmapa’s 17th incarnation . On June 9, 1992, Situ Rinpoche and Gyaltsab Rinpoche contacted the Dalai Lama, who was in Brazil, by phone and fax. They told him that all the Kagyu lamas unanimously requested his confirmation of Urgyen Trinley in Tsurphu as being the 17th Karmapa. Consequently an informal confirmation was issued from the Dalai Lama’s private office in Dharamsala. Evidently the Dalai Lama had not been informed about the controversy among the highest Kagyu lamas . On June 10, 1992, Lama Ole Nydahl (who with his wife Hannah were the first western students of the 16th Karmapa, and started, by then, over 120 meditation centres in his name) wrote an open letter to the three lineage holders stating that any decision about the 17th Karmapa had to be officially approved by Shamar Rinpoche, Topga Rinpoche and the Karmapa Charitable Trust. Without such an endorsement neither he nor the centres he had started would accept their selection . On June 11, 1992, Shamar Rinpoche sent a letter to the Karma Kagyu followers, expressing his doubts about Situ Rinpoche’s “prediction letter” . On June 11, 1992, around 11 p.m., Shamar Rinpoche received a phone call from an Indian Army General informing him that a party of soldiers was being dispatched to Rumtek to protect him and the monastery. The army had received information that two buses with Tibetans from Kathmandu were on their way to Rumtek to put pressure on Shamar Rinpoche and the monastery. The soldiers arrived in the middle of the night. On June 12, 1992, Situ Rinpoche and Gyaltsab Rinpoche returned from Dharamsala. At once they called a meeting of the Rumtek monk and lay communities. In their speeches delivered in the monastery yard, the two presented a “fait accompli”: the 17th Karmapa would come to Tsurphu in a few days, and the Dalai Lama had given his approval. Shamar Rinpoche was informed about the gathering while it was already in progress. When Rinpoche went from his house to the monastery to talk to the two lineage holders, he was followed by the soldiers who had orders to protect him. Seeing him enter the monastery yard at the head of a group of soldiers, Situ Rinpoche and Gyaltsab Rinpoche jumped from their thrones, ran into the main building, locked themselves in and had guards posted in front of the doors . On June 15, 1992, Urgyen Trinley arrived in Tsurphu in a convoy of about seven vehicles. A car accident took place on their way to Tsurphu and two people were killed. Chinese officials took part in the welcoming ceremony and were among the principal guests. No representatives from Rumtek were present . On June 16, 1992, signatures were collected from the Lamas and Tulkus attending the final rituals for the late Jamgon Kongtrul Rinpoche in Rumtek. Two letters were being passed around for signing. In the first one, the undersigned declared that they “accepted the unmistaken prediction letter”; in the second one they expressed their gratitude to the Dalai Lama for his confirmation . On June 16, 1992, Tulku Urgyen from Nepal, a senior lama and teacher to the Rinpoches, came to Rumtek to mediate. After talking to Situ Rinpoche he held a meeting with Shamar Rinpoche. He urged Shamarpa to give his agreement because the Dalai Lama had already given his approval. He also reasoned that China had acknowledged the child and would never withdraw from this position. On June 17, 1992, Shamar Rinpoche and Situ Rinpoche met. Out of respect for the Dalai Lama, Shamar Rinpoche suspended his demand that the letter of prediction be tested forensically . On June 22, 1992, Situ Rinpoche and Gyaltsab Rinpoche sent a letter to the followers of the lineage declaring that the 17th Karmapa had been found, that the Dalai Lama had confirmed him, and that all the disagreements had been resolved . On June 29, 1992, Beijing officially recognised Urgyen Trinley as the 17th Karmapa, bestowing the title of “Living Buddha” upon him. A series of reports were published. For example, one official Tibetan newspaper declared that “the 17th Karmapa … will become an individual loyal to his socialist motherland…” . The fact that the Communist government used the installation of a “Living Buddha” for its own political purposes became more and more apparent. On June 29, 1992, Situ Rinpoche and Gyaltsab Rinpoche had a personal audience with the Dalai Lama to receive his official approval of Urgyen Trinley as the 17th Karmapa. A few hours later, Shamar Rinpoche also called on the Tibetan leader and presented his position. .
At the end of June, 1992, Lama Ole Nydahl sent a letter to all his students from Volgograd, Russia. He declared that until they had a Karmapa that all could accept, he was placing all the centres he started for the 16th Karmapa under Kunzig Shamarpa’s spiritual guidance. Once again he insisted that the prediction letter be forensically tested. Together with the General Secretary Topga Rinpoche and a handful of young lamas, Hannah and Lama Ole Nydahl were, at the moment, the only ones demanding that Situ Rinpoche’s letter be put to a scientific test. Nearly all of Lama Ole’s centres backed their teacher and refused to accept Urgyen Trinley before the prediction letter that located the boy was scientifically examined and before the candidate clearly proved himself . On July 3, 1992, the Department of Information and International Relations of the Tibetan Government in Exile sent a statement with the official approval of Urgyen Trinley by the Dalai Lama . At this point, it should be clearly stated that the recognition of the Karmapa does not lie in the hands of the Tibetan Government, or of the Dalai Lama. The Karmapa’s reincarnations date back to the 12th century, whereas the Dalai Lama’s line of reincarnation started 300 years later. The confirmation of a reincarnation is a purely spiritual matter of the respective lineage. However, Situ Rinpoche and Gyaltsab Rinpoche tried to strengthen their position by gaining the approval of the Dalai Lama. To achieve this, they claimed that a consensus existed among all Kagyu Lamas. In July 1992, the German magazine “Kagyu Life” devoted a whole issue to the Karmapa controversy. In his dispatch from a meditation course in Irkutsk, Russia, Lama Ole hoped that Urgyen Trinley and his family were now not hostages to the Communists Chinese, who surely needed a new lama for their “divide and conquer” strategy in occupied Tibet. Following the Panchen Lama’s death, they could no longer use his name and his seat for this purpose. On Aug. 3, 1992, the General Secretary of the Karmapa Charitable Trust wrote a letter to the Board of Trustees expressing his concern regarding the Karmapa issue and asking the Trustees to secure the wishes of the late 16th Karmapa . During this time, Situ Rinpoche and Gyaltsab Rinpoche made announcements in Kathmandu and again asked people to sign various letters to show their agreement that Urgyen Trinley was the 17th Karmapa . They rectified their previous assurances and explained that the boy would not immediately come out of Tibet, but would be first enthroned in Tsurphu and would visit India and Nepal soon after. On Aug 8, 1992, Lama Ole Nydahl wrote a letter to the Tibetan Government in Dharamsala. It was a reply to a recently issued statement from their Department of Religion and Culture that assured all concerned there had been no improprieties from the Dalai Lama’s side in having given his final approval to the 17th Karmapa’s recognition. Speaking on behalf of more than a hundred and twenty western Kagyu centres around the world, Lama Ole once again pointed to the discrepancy between Situ and Gyaltsab Rinpoche’s claim of a consensus among the Kagyu lamas, and Shamar Rinpoche’s actual rejection of the letter. His Holiness had given his informal approval at a conference in Brazil under the mistaken impression that all Kagyu Rinpoches stood together. On Sept. 27, 1992, the official enthronement of Urgyen Trinley took place in Tsurphu. Even though Situ Rinpoche and Gyaltsab Rinpoche insisted that all problems had been solved, the members of Rumtek Monastery, the members of the Karmapa Charitable Trust, and the representatives of the major Kagyu centres in the West did not approve of this procedure. Kunzig Shamar Rinpoche, historically second after the Karmapa in the spiritual hierarchy of the Karma Kagyu lineage, did not take part in the ceremonies. Some weeks after the Tsurphu enthronement a report by Lobsang Gelek Rinpoche revealed that many inauspicious events occurred at that time . In October 1992, a book called “The Karmapa Papers” shed light on the background of the ongoing Karmapa issue. The publication presented a chronology of events since Karmapa’s death in 1981, the translation of a large number of letters exchanged among the four Rinpoches and between the Rinpoches and the Karmapa Charitable Trust since 1983, an analysis of Situ Rinpoche’s “prediction letter” and the transcription of the speeches given by the Rinpoches in Rumtek, in June 1992 at the outcome of the crisis. In the autumn of 1992, Drubpoen Dechen, sent letters to the monks, the administration, and the lay community of Rumtek Monastery trying to intimidate them and to persuade them to accept Urgyen Trinley as the 17th Karmapa. On Nov. 17, 1992, Shamar Rinpoche wrote a letter to the monks of Rumtek Monastery. He stated that he would not object to the Chinese government’s decision, that his agreement with the Dalai Lama’s decision had only been given out of his respect for the Dalai Lama, and that he would hold firm to the sacred tradition and follow the genuine instructions of the 16th Karmapa. He asked the monks that, following the wishes of the 16th Karmapa, Rumtek Monastery be held jointly by Rumtek’s monks and the Trustees of the Karmapa Charitable Trust. In November 1992, Gyaltsab Rinpoche’s people invited representatives from monasteries in Nepal to Rumtek, where they were planning a meeting. During this time, people from Nepal informed Rumtek that Situ Rinpoche and Gyaltsab Rinpoche were secretly preparing a take-over of Rumtek Monastery. On Nov. 20, 1992, the Rumtek monks and Shamar Rinpoche held another gathering. After the meeting, the monks informed the Sikkimese Chief Minister Bandari that together with the Trustees of The Karmapa Charitable Trust, they would take full responsibility for the affairs of Rumtek Monastery, and that it was the Trust’s responsibility to subject Situ Rinpoche’s “prediction letter” to a scientific test. They also declared that the administration of Rumtek monastery was solely the responsibility of Rumtek’s monks and The Karmapa Charitable Trust, and that they would accept no other spiritual authority. Their letter was followed by a number of similar statements made by the Khenpos (head monks), the Rumtek administration, the Nalanda Institute, and the Rumtek Nunnery. They all declared that they would only follow the decisions made by the Karmapa Charitable Trust, whose Trustees were appointed by the 16th Karmapa himself, and that they would not accept any other decisions made by Lamas or political groups. On Nov. 29, 1992, representatives of the Rumtek Monk Community, the Rumtek administration, the Nalanda Institute and the Rumtek Nunnery stated that until a clear agreement among the Rinpoches was reached they would only follow the decisions of the Karmapa Charitable Trust with Topga Rinpoche as the General Secretary. On Nov. 30, 1992, against the wish of the Rumtek community, a meeting organised by Situ Rinpoche and Gyaltsab Rinpoche took place in Rumtek. It was called the “Kagyu International Assembly” and claimed to consist of representatives from all Kagyu monasteries and centres from around the world. In fact, there were only Tibetans present. None of the Karma Kagyu centres founded by Lama Ole Nydahl were represented. A number of resolutions, such as an oath to never accept any other Karmapa than Urgyen Trinley, were passed. Topga Rinpoche, the General Secretary of the Karmapa Charitable Trust, was accused of serious offences and strongly condemned. A series of illegal decisions were taken, such as the dismissal of the General Secretary. The other trustees were threatened that if they did not support Urgyen Trinley, they would be forced to resign from their posts. The Assembly did not have any legal authority to interfere with the matters of the Karmapa Charitable Trust. and its decisions had no legal value. However, the participants went so far as to replace the Karmapa Charitable Trust with a new body. The new trust was formed with Gyaltsab Rinpoche as the official administrator and a Drungyig Tenzin  as the new General Secretary. The documents to register the trust in Sikkim were sent to the authorities, but the petition was dismissed. In Jan. 1993, Situ Rinpoche’s and Gyaltsab Rinpoche’s party requested the withdrawal of the copies of Registration of Resolutions from the Land Revenue Department in Sikkim. In Dec. 1992, Kagyu centres world-wide sent letters of support to the legal trustees of the Karmapa Charitable Trust. The trustees were encouraged to continue with their responsibility of managing Karmapa’s institutions, a task that was personally entrusted to them by the 16th Karmapa. In the beginning of 1993, the followers of Urgyen Trinley announced that the 17th Karmapa would soon leave China and travel to the West. A number of petitions and letters, requesting permission for Urgyen Trinley to enter India, were sent to the Indian Government. Today, despite years of intense campaigning, it is evident that the boy will never be allowed to leave occupied Tibet. In 1993, some Sikkimese followers of the 16th Karmapa filed a petition at the High Court of Sikkim in Gangtok. Because of their suspicion of forgery, they demanded a forensic test of Situ Rinpoche’s “prediction letter” – the basis upon which Urgyen Trinley was officially acknowledged as the 17th Karmapa. In Jan. 1993, Situ Rinpoche and Gyaltsab Rinpoche’s party published an edition of the Kagyu magazine “The Nectar of Dharma”. The “Nectar of Dharma” had first come out in Rumtek in the ’80s. The 1993 edition reported mainly on the “Kagyu International Assembly” that had taken place in Rumtek between Nov. 30 and Dec. 3, 1992, hailing its illegal resolutions. In May 1993, confidential information pertaining to Communist China’s political aims in Tibet became publicly known. The Chinese authorities decided on a “final solution” to break the Tibetan resistance. They planned to continue “manipulating religious persons in Tibet for propaganda purposes” . In May 1993, Tenzin Choenyi of the Buddhist centre KTD-Woodstock, USA, mailed a letter to the Karma Kagyu institutions world-wide in which he announced that Urgyen Trinley would come to KTD-Woodstock in 1994 and that funds, amounting to US-$ 200,000 should be collected for his visit. On June 17, 1993, at a United Nations Conference on Human Rights in Vienna, Austria, the Chinese delegates announced “that the Karmapa, the future successor of the Dalai Lama, was preparing for his tasks in Tibet”. In July 1993, the legal administration of Rumtek published a “Rumtek Newsletter”, where the activities of the Rumtek administration and the events surrounding the Karmapa controversy were presented . On July 26, 1993, Kunzig Shamar Rinpoche left Rumtek for dharma events scheduled abroad. Shortly after his departure Situ Rinpoche arrived at Rumtek. On Aug. 2, 1993, Rumtek Monastery was illegally and forcibly taken over by Situ Rinpoche and Gyaltsab Rinpoche’s supporters, many of whom were hired criminals disguised as monks. The genuine Rumtek monks were threatened at gunpoint, harassed, and beaten up. One of the 16th Karmapa’s monks, the chanting master Umze Ngedon, who was in possession of the keys to the main hall of the monastery, was dragged around the monastery yard with his robes tied around his neck . The police present in the monastery did nothing to stop the attack and even supported the intruders . Some of Rumtek’s genuine monks were arrested and later imprisoned in Ranipool. The resident monks had to flee the monastery . They sought shelter in Shamar Rinpoche’s residence where they continued their monastic routine in cramped conditions. The genuine monks sent a letter to Situ Rinpoche asking him to leave Rumtek, since he had caused such disruption at Karmapa’s headquarters. There were rumours that Situ Rinpoche’s and Gyaltsab Rinpoche’s party planned to remove Karmapa’s Black Crown and other relics from the monastery and take them to China. During the following days, Tai Situ and his party launched a full scale campaign to portray themselves as the victims of the monks’ aggression and the sole defenders of Karmapa’s legacy. On Aug 4, 1993, Shamar Rinpoche gave an interview to the German Karma Kagyu Association about the attack on Rumtek. He expressed his great concern for the monks, who had been intimidated, beaten and forced to leave the monastery, and in general for the situation in the monastery. The same day people from Situ Rinpoche’s party signed an open letter in Gangtok, Sikkim containing serious accusations against Shamar Rinpoche. On August 13, 1993, a variety of organisations from Gangtok, Sikkim formed „The Action Committee”, a group that would apply pressure on anyone who disputed Situpa’s letter and his candidate. A few days later the Committee members staged a violent protest in front of the Sikkimese Supreme Court and in front of the home of Mr. Sherab Gyaltsen, a trustee of the Karmapa Charitable Trust. On Aug. 22, 1993, a letter was mailed from Samye Ling, Akong Rinpoche’s centre in Scotland, announcing that Urgyen Trinley would come to Europe and America in 1994 and requesting funds as extensive financial resources were needed for Urgyen Trinley’s journey. On Sept. 12, 1993, Shamar Rinpoche sent an open letter to Situ Rinpoche to inform him that he disapproved of Situ Rinpoche’s activities, and that he would try to reverse, by legal means, all the latest changes that Situ Rinpoche had made to the status and peace of Rumtek Monastery. On Jan. 25, 1994, Kunzig Shamar Rinpoche made an announcement in Tibetan and in English that the 16th Karmapa’s authentic reincarnation had been found. Thereupon, Situ Rinpoche’s and Gyaltsab Rinpoche’s party held secret meetings to plan a “confrontation” between the two Karmapas including one in Kathmandu, Nepal with many prominent followers of Situ Rinpoche: Thrangu Rinpoche, Mr. Juchen Thubten , Drungyig Tenzin , Jinpa Lodro , and others. On Feb. 9, 1994, representatives from various monasteries addressed a letter to the Dalai Lama in which they referred to Shamar Rinpoche’s announcement. They reminded the Dalai Lama of his approval of Urgyen Trinley, said that there can be only one Karmapa and emphasised that they disagreed with Shamar Rinpoche. On Feb. 28, 1994, Lama Ole Nydahl sent a letter to his students where he described his and Hannah’s first three meetings with a boy then named Tenzin Chyentse (later Trinley Thaye Dorje), whom he believed to be the right incarnation of the 17th Karmapa. „His mildness and maturity, which had already touched us, were now completed as he activated the powerful blessing which fills space and is so uniquely Karmapa to us”, Lama Ole wrote after their third meeting. On March 17, 1994, Kunzig Shamar Rinpoche welcomed Tenzin Chyentse (Trinley Thaye Dorje) as the genuine reincarnation of the 16th Karmapa  at the Karmapa International Buddhist Institute (KIBI) in New Delhi . Karmapa Trinley Thaye Dorje had been living in Tibet until early 1994 when, together with his family, he left for India. After the ceremony, a group of monks and laymen organised by Situ Rinpoche and Gyaltsab Rinpoche’s party gathered in front of KIBI and demonstrated against Karmapa Trinley Thaye Dorje. They shouted slogans, threw stones at the Institute, at the monks and the visitors, and tried to storm the premises. Several people, among them Western followers of the Karmapa who had come to attend the welcoming ceremony, were injured and had to be hospitalised. The violent incident was witnessed by almost 500 people and recorded on videotape . The protesters, accusing Shamar Rinpoche and Topga Rinpoche of presenting a fake Karmapa, shouted that they would never accept their choice and that the two Rinpoches were going against the Dalai Lama. They also claimed that the boy was a member of Shamar Rinpoche’s family, which was not true. On March 19, 1994, Shamar Rinpoche gave a public talk at KIBI. He stated that he would reveal the details about the finding of the 17th Karmapa when the appropriate time came. He said that he didn’t object to anyone who accepted the Chinese installed boy, but that he would disagree if someone forced him to follow that “Karmapa”. He emphasised that he wanted a spiritually, and not a politically, appointed Karmapa and welcomed everybody who wished to follow him. He pointed out that the Karmapa’s reincarnations did not require the acceptance of a government. On March 31, 1994, Shamar Rinpoche wrote a letter to the board of trustees of the Karmapa Charitable Trust in which he gave a summary of his activities since 1981. He stated that he would reveal the authentic instructions of the previous Karmapa at the appropriate time . In March 1994, letters of protest were sent from various Kagyu lamas such as Thrangu Tulku, Sangye Nyenpa Tulku and Tenga Tulku. They all objected to Karmapa Trinley Thaye Dorje. At the same time, several Kagyu Rinpoches came secretly to Delhi to meet Karmapa Trinley Thaye Dorje. On April 3, 1994, Shamar Rinpoche wrote an account of the discovery of the 17th Karmapa. He recounted how, beginning in 1986, he had received reports of the special qualities of a boy Trinley Thaye Dorje. He described how he had sent emissaries to Tibet to contact and check the child and how the Karmapa had revealed himself as the genuine reincarnation. In 1988, the person who claimed to have received the genuine instructions from the 16th Karmapa had contacted Kunzig Shamarpa. On April 6, 1994, some Indian newspapers  reported the news of Bhandari’s prosecution by the Sikkimese Supreme Court on corruption charges. Bhandari, the Chief Minister of Sikkim, had supported Situ Rinpoche in his activities regarding the Karmapa reincarnation. On April 23, 1994, a meeting between the Dalai Lama’s administration and the legal Rumtek administration took place. Shamar Rinpoche’s position, as well as the position of Rumtek’s genuine monks was clarified. On May 16, 1994, the Tibetan Radio in Tibet broadcast the “prediction letter” presented by Situ Rinpoche. A written version was published as well. The wording was quite different from the original version shown by Situ Rinpoche in 1992. Awkward and grammatically incorrect passages had been rewritten. On June 14, 1994, the Sikkimese Monks’ Union passed a resolution in which they declared that they only wanted a genuine Karmapa based on authentic instructions. They also complained about the bad treatment they had received from the Sikkimese government. On July 12, 1994, Rumtek’s genuine monks addressed a letter to the Chief Secretary in Sikkim. They complained of the illegal removal of numerous precious articles of religious worship from Rumtek Monastery. They listed the missing items, and expressed their concern that Karmapa’s Black Hat and Situ Rinpoche’s “prediction letter” might have been also removed. On Aug. 2, 1994, the Ministry of Home Affairs of the Government of India, declared that Situ Rinpoche was officially banned from entering India due to his anti-India activities. On Sept. 18, 1994, the World Tibet Network reported Situ Rinpoche’s ban from India. On Sept. 22, 1994, the World Tibet Network broadcast a report about Urgyen Trinley, the ten-year-old “Living Buddha”, The report stated that the boy had set out on a pilgrimage to Beijing. This was followed by a series of articles on Urgyen Trinley’s visit to his Chinese “Motherland”. In Nov. 1994, having been banned from India, Situ Rinpoche set out on a lecture tour in Europe. Some of his appearances (Cambridge, England and Freiburg, Germany) were planned to coincide with Lama Ole Nydahl’s lectures. Enclosed in the promotion for Rinpoche’s talks was a fundraising letter that emphasised Situ Rinpoche’s great need for money. In 1994, an ugly incident took place in Rumtek: Benza Guru, a 51-year-old house-keeper of the late 16th Karmapa was murdered by individuals illegally occupying Rumtek Monastery. He had refused to leave the monastery and had been repeatedly threatened by the occupants. Even though his murder was reported to the local police, no one has been arrested to this day. In Dec. 1994, elections were held in Sikkim. The ruling party suffered a severe defeat. This marked the end of Chief Minister Bhandhari’s rule. While in power, he had actively supported Situ Rinpoche and Gyaltsab Rinpoche. Police under his command had harassed the Rumtek monks as well as all of Shamar Rinpoche’s supporters in Rumtek. On Feb. 17, 1995, members of the Rumtek monks’ community, such as Nendo Rinpoche, Chultrimpa and others, addressed a letter to the new Chief Minister of Sikkim, Pawan Kumar Chamling. They stated that people associated with Situ Rinpoche continued his anti-national activities, that the original monks in Rumtek were still heavily suppressed, that the monastery was still in the hands of Situ Rinpoche’s and Gyaltsab Rinpoche’s side, and that the police still supported the illegal occupation. The Chief Minister was requested to take action so that law and order would be restored in Rumtek. In the spring of 1995, there were many reports distributed by official Chinese news agencies about Urgyen Trinley in Tsurphu, . The reports disclosed, for example, that the boy promised “always to follow the Communist Party of China”. In April 1995, after the change of government in Sikkim, Topga Yulgal, the legal General Secretary of the Karmapa Charitable Trust, was able to return to Sikkim in order to assume his functions. His entry had been blocked by the former government . On May 8, 1995, Lurnyuk, a local Sikkimese newspaper, published an article about Topga Rinpoche, the General Secretary of the Karmapa Charitable Trust, and his strong support in Sikkim. In May 1995, the Panchen Lama issue was discussed world-wide on the Internet and in the news media. The course of events clearly showed how Communist China continued to use the so-called “Living Buddhas” for her own political aims. On August 8, 1995, Topga Rinpoche and the Karmapa’s original monks peacefully – with flowers in their hands – marched to Rumtek monastery in order to return to their rightful home and place of worship. However, they were brutally stopped and denied access to their temple by the illegal occupants of the cloister. The monks started then an indefinite hunger strike in front of the gates to their monastery as a protest against the continuing, illegal occupation of Rumtek. In addition to the monks, the nuns, and lay people from Rumtek, as well as the Sikkimese people joined in the hunger strike. On Aug. 8, 1995, Situ Rinpoche and Gyaltsab Rinpoche’s side issued articles on the Internet in which the Rumtek monks were accused of having violently attacked the monastery. On Aug. 9, 1995, a press release by the monk community of Rumtek Monastery and eyewitnesses’ reports presented the monks’ version of their march on Rumtek and subsequent hunger strike. At the end of September 1995, after nearly two months, the 16th Karmapa’s monks had to abandon their hunger strike. Rumtek Monastery, Karmapa’s main seat outside Tibet, is today still in the hands of intruders. From March 28, 1996 till March 30, 1996 an International Karma Kagyu Conference took place in KIBI, New Delhi, India. The conference was convened at the request of the original monastic community of Rumtek Monastery. Representatives from Karma Kagyu Monasteries and Dharma Centres in the Himalayan region as well as from Dharma Centres from twenty-four countries from around the world attended. Kunzig Shamar Rinpoche presented the background of his recognition of Karmapa Thaye Dorje as the 17th incarnation of Gyalwa Karmapa. The Karmapa resident monks reported on the course of events at Rumtek Monastery related to the Karmapa issue. In Dec. 1996, the 17th Karmapa Thaye Dorje presided over the Monlam Chenmo, great aspiration prayers, in Bodh Gaya, India, the place of Buddha’s enlightenment. Also, for the first time in history a Karmapa had his hair cut in Bodh Gaya – a ceremony that officially initiated his activity in the world. Over 6.000 monks and nuns as well as a large number of Rinpoches and lamas from the Himalayan region attended the event. Karmapa Thaye Dorje resides today in KIBI, New Delhi, India. People are welcome to visit him. The Chinese appointed Karmapa, Urgyen Trinley resides today at Tsurphu Monastery in occupied Tibet. Access to Tsurphu has been severely limited by the Communist Chinese authorities. For many of the quoted letters or documents please see „The Karmapa Papers”. This 1992 publication and analysis of the Karmapa Controversy is an excellent source of original documents. It is available from Clear Light Books USA (e-mail: books@clearlight.com) or Logos Books International in Europe (e-mail: info@logosbooks.com). Karmapa Papers. This book came out in 1992. Regarding this footnote see transcriptions of the talks in Karmapa Papers, part D, 2. These events occured both in Rumtek and Tsurphu. Some of the events were: water dripping from the Buddha statue in the shrine hall (Rumtek), the sword of the Manjushri statue falling out of Manjushri’s hand (Rumtek), the golden banner (Sertok) falling down and then leaning to the side (Rumtek), a car accident in the convoy bringing the boy to Tsurphu, which killed two people (Tsurphu), empty offering bowls on the shrine during the enthronement ceremony (Tsurphu), a big boulder rolling down the mountain slope beside the monastery injuring people (Tsurphu). Letter signed by the mentioned representatives on Nov. 29, 1992. The names of all police officers present are filed. See report by Mark V. Tchelistcheff from Aug. 3 1993. The Hindustan Times, Aug. 6 1993. Another written report about the take over came from Yeshe and Lodro. An ex-minister of the Dalai Lama, who from the beginning of the controversy had been very active. The illegal new General Secretary of Rumtek. A representative of Tenga Rinpoche’s monastery. The “Karmapa International Buddhist Institute” (KIBI) was one of the major projects of the 16th Karmapa. See newspaper reports of Hindustan Times, The Statesman and others from March 1994. There is a video tape called “The Attack” which documents this violent indicident. See his letter dated March 31 1994.